During the World Electric Aircraft Symposium at AirVenture on Friday, Erik Lindbergh will be awarding the first set of prizes designed to promote the practical development of electric aircraft by recognizing specific advances in this emerging clean technology industry. Prizes are only one piece of the program that Erik, and LEAP Executive Director Yolanka Wulff, have incubated over the last year, and brought to AirVenture. "The Lindbergh Electric Aircraft Prize (LEAP) is the culmination of my work over the last decade in aviation, education and prize philanthropy. LEAP represents the perfect focal point to light up both kids and adults. We are literally teaching the next generation to imagine and create their future," explains LEAP Founder, Erik Lindbergh. Six students from the Aviation High School in Seattle, Washington, are imagining their future as journalists and have been tasked with preparing a documentary on the Electric Aircraft Learning Center and Symposium. These six AVHS students share a passion for videography and journalism, in addition to aviation, carefully woven throughout the varied and demanding program at the small, public school, established in 2004. Throughout the week, AVHS students were busy interviewing exhibitors in the GE Aviation Learning Center, dedicated to electric aircraft for this years' event. Building a project-based curriculum is a key component for LEAP's education initiative. "The idea is to model the real work world so students invest themselves in problem solving," said Yolanka. "Once the interviews and filming at AirVenture ends, the students will decide the approach, their roles and work as a team." The students are also producing a documentary on the experience of producing the documentary on electric aircraft. We are starting with one school this year, and anticipate having six schools participating in next year's theme, which will cover a different perspective of green technology in aviation. "A goal is to grow this education program to something that could be the scale of First Robotics," says Erik. "Dean Kamen, the founder of FIRST, is also on LEAP's board. Teachers will be documenting the project and build a Green Aviation curriculum. 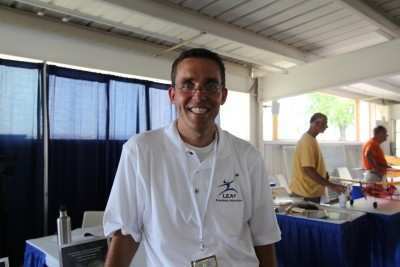 "LEAP participants will be able to see themselves in many roles of aviation," says Erik. "The initiative and career choices will highlight best practices in project based education." The students are accompanied by their English teacher Mary Ciccone-Cook and Scott McComb, Assistant Director at AVHS. 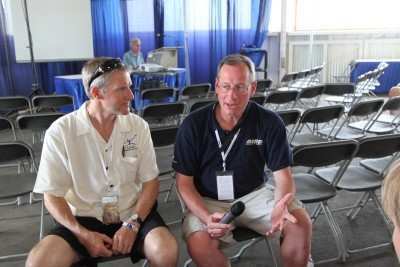 While ANN's Paul Plack was interviewing Erik Lindbergh in the Aviation Learning Center, the tables quickly turned. Ms. McComb pointed out to her students where they should note the interview techniques. It wasn't long before Paul was being interviewed by Ms. Comb and the LEAP students. Ms. McComb described her role changing, being more of an advisor, once they returned with the material collected at Oshkosh. "At AVHS, the kids stop asking, SO WHAT", says AVHS' McComb. 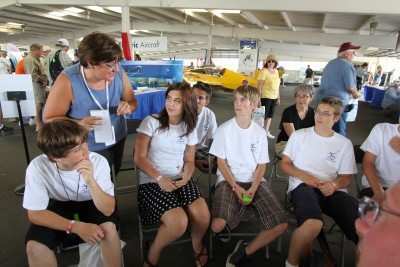 For a school that believes in project based learning, 'aviation has it all'. "We get tremendous support of mentors from the large aerospace workforce in the area." Before coming to work at AVHS, Scott taught general science courses; he is now pursuing his private pilot certificate. Funding for the AirVenture visit is being shared between LEAP and AVHS. McComb was able to tap into an Allen Foundation grant provided to AVHS for career mentoring program to fund portion of the costs of coming to AirVenture and LEAP sponsors helped with the rest. As the LEAP "start-up" moves through the prototype stage, Erik is seeking corporate sponsors to support future aviation prizes and scholarships. During the final days at AirVenture, there will be more information coming on the Lindbergh prize and other related initiatives associated with the Electric Aircraft Symposium. ANN will also be introducing the LEAP students from AVHS.